December 31 is the 365th day of the year(366th in leap years) in the Gregorian calendar. It is known by a collection of names including: Saint Sylvester's Day, New Year's Eve or Old Years Day/Night, as the following day is New Year's Day. It is the last day of the year. The following day is January 1 of the following year. Saint Sylvester's Day, also known as Silvester or the Feast of Saint Sylvester, is the day of the feast of Pope Sylvester I, a saint who served as Pope of the Western Church from 314 to 335 and is considered by tradition as overseeing both the First Council of Nicaea and Roman Emperor Constantine I's conversion to Christianity. Among the Western Christian Churches, the feast day is held on the anniversary of Saint Sylvester's death, 31 December, a date that, since the adoption of the Gregorian calendar, has coincided with New Year's Eve. For these Christian denominations, Saint Silvester's Day liturgically marks the seventh day of Christmastide. Eastern Orthodox Churches celebrate Sylvester's feast on a different day from the Western Churches, i.e. on 2 January. Saint Sylvester's Day celebrations are marked by church attendance at Midnight Mass or a Watchnight service, as well as fireworks, partying, and feasting. 406 – Vandals, Alans and Suebians cross the Rhine, beginning an invasion of Gaul. 535 – Byzantine general Belisarius completes the conquest of Sicily, defeating the Gothic garrison of Palermo (Panormos), and ending his consulship for the year. 870 – Battle of Englefield: The Vikings clash with ealdorman Æthelwulf of Berkshire. The invaders are driven back to Reading (East Anglia), many Danes are killed. 1225 – The Lý dynasty of Vietnam ends after 216 years by the enthronement of the boy emperor Trần Thái Tông, husband of the last Lý monarch, Lý Chiêu Hoàng, starting the Trần dynasty. 1229 – James I of Aragon the Conqueror enters Medina Mayurqa (now known as Palma, Spain) thus consummating the Christian reconquest of the island of Majorca. 1501 – The First Battle of Cannanore commences. 1600 – The British East India Company is chartered. 1660 – James II of England is named Duke of Normandy by Louis XIV of France. 1687 – The first Huguenots set sail from France to the Cape of Good Hope. 1757 – Empress Elizabeth I of Russia issues her ukase incorporating Königsberg into Russia. 1775 – American Revolutionary War: Battle of Quebec: British forces repulse an attack by Continental Army General Richard Montgomery. 1790 – Efimeris , the oldest Greek newspaper of which issues have survived till today, is published for the first time. 1796 – The incorporation of Baltimore as a city. 1831 – Gramercy Park is deeded to New York City. 1853 – A dinner party is held inside a life-size model of an iguanodon created by Benjamin Waterhouse Hawkins and Sir Richard Owen in south London, England. 1857 – Queen Victoria chooses Ottawa, then a small logging town, as the capital of Canada. 1862 – American Civil War: Abraham Lincoln signs an act that admits West Virginia to the Union, thus dividing Virginia in two. 1862 – American Civil War: The Battle of Stones River begins near Murfreesboro, Tennessee. 1878 – Karl Benz, working in Mannheim, Germany, filed for a patent on his first reliable two-stroke gas engine, and he was granted the patent in 1879. 1879 – Thomas Edison demonstrates incandescent lighting to the public for the first time, in Menlo Park, New Jersey. 1906 – Mozaffar ad-Din Shah Qajar signs the Persian Constitution of 1906. 1907 – The first New Year's Eve celebration is held in Times Square (then known as Longacre Square) in Manhattan. 1944 – World War II: Hungary declares war on Nazi Germany. 1944 – World War II: Operation Nordwind, the last major German offensive on the Western Front begins. 1946 – President Harry S. Truman officially proclaims the end of hostilities in World War II. 1951 – Cold War: The Marshall Plan expires after distributing more than US$13.3 billion in foreign aid to rebuild Western Europe. 1955 – General Motors becomes the first U.S. corporation to make over US$1 billion in a year. 1956 – The Romanian Television network begins its first broadcast in Bucharest. 1961 – RTÉ, Ireland's state broadcaster, launches its first national television service. 1963 – The Central African Federation officially collapses, subsequently becoming Zambia, Malawi and Rhodesia. 1965 – Jean-Bédel Bokassa, leader of the Central African Republic army, and his military officers begins a coup d'état against the government of President David Dacko. 1968 – The first flight of the Tupolev Tu-144, the first civilian supersonic transport in the world. 1981 – A coup d'état in Ghana removes President Hilla Limann's PNP government and replaces it with the Provisional National Defence Council led by Flight lieutenant Jerry Rawlings. 1983 – The AT&T Bell System is broken up by the United States Government. 1983 – Benjamin Ward is appointed New York City Police Department's first ever African American police commissioner. 1983 – In Nigeria a coup d'état led by Major General Muhammadu Buhari ends the Second Nigerian Republic. 1986 – Arson at the Dupont Plaza Hotel in San Juan, Puerto Rico kills 97 people and injures 140. 1991 – All official Soviet Union institutions have ceased operations by this date five days after the Soviet Union is officially dissolved. 1992 – Czechoslovakia is peacefully dissolved in what is dubbed by media as the Velvet Divorce, resulting in the creation of the Czech Republic and the Slovak Republic. 1994 – This date is skipped altogether in Kiribati as the Phoenix Islands and Line Islands change time zones from UTC−11:00 to UTC+13:00 and UTC−10:00 to UTC+14:00, respectively. 1994 – The First Chechen War: Russian army began a New Year's storming of Grozny. 1998 – The European Exchange Rate Mechanism freezes the values of the legacy currencies in the Eurozone, and establishes the value of the euro currency. 1999 – The first President of Russia, Boris Yeltsin, resigns from office, leaving Prime Minister Vladimir Putin as the acting President and successor. 1999 – The United States Government hands control of the Panama Canal (as well all the adjacent land to the canal known as the Panama Canal Zone) to Panama. This act complied with the signing of the 1977 Torrijos–Carter Treaties. 1999 – Indian Airlines Flight 814 hijacking ended after seven days with the release of 190 survivors at Kandahar Airport, Afghanistan. 2000 – The last day of the 20th Century and 2nd Millennium. 2004 – The official opening of Taipei 101, the tallest skyscraper at that time in the world, standing at a height of 509 metres (1,670 ft). 2009 – Both a blue moon and a lunar eclipse occur. 2010 – Tornadoes touch down in midwestern and southern United States, including Washington County, Arkansas; Greater St. Louis, Sunset Hills, Missouri, Illinois, and Oklahoma, with a few tornadoes in the early hours. A total 36 tornadoes touched down, resulting in the deaths of nine people and $113 million in damages. 2011 – NASA succeeds in putting the first of two Gravity Recovery and Interior Laboratory satellites in orbit around the Moon. 2014 – A New Year's Eve celebration stampede in Shanghai kills at least 36 people and injures 49 others. 2015 – A fire broke out at the Downtown Address Hotel in Downtown Dubai, United Arab Emirates located near the Burj Khalifa two hours before the fireworks display was due to commence. Sixteen injuries were reported; one had a heart attack, another suffered a major injury, and fourteen others with minor injuries. 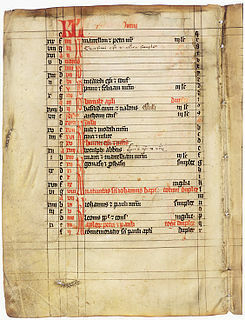 Year 406 (CDVI) was a common year starting on Monday of the Julian calendar. At the time, it was known as the Year of the Consulship of Arcadius and Probus. The denomination 406 for this year has been used since the early medieval period, when the Anno Domini calendar era became the prevalent method in Europe for naming years. The Alans were an Iranian nomadic pastoral people of antiquity. Year 695 (DCXCV) was a common year starting on Friday of the Julian calendar. The denomination 695 for this year has been used since the early medieval period, when the Anno Domini calendar era became the prevalent method in Europe for naming years. 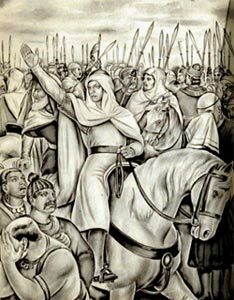 ‘Imād ad-Dīn Muḥammad bin Qāsim ath-Thaqafī was an Umayyad general who conquered the Sindh till Multan along the Indus River and then controlled for a short period of 4 years for the Umayyad Caliphate. He was born and raised in the city of Ta'if. Qasim's conquest of Sindh up to southern-most parts of Multan enabled further Muslim conquests on the Indian subcontinent. Year 45 BC was either a common year starting on Thursday, Friday or Saturday or a leap year starting on Friday or Saturday and the first year of the Julian calendar and a leap year starting on Friday of the Proleptic Julian calendar. At the time, it was known as the Year of the Consulship of Caesar without Colleague. The denomination 45 BC for this year has been used since the early medieval period, when the Anno Domini calendar era became the prevalent method in Europe for naming years. Quintus Fabius Maximus was a general and politician of the late Roman Republic who became suffect consul in 45 BC. Year 192 (CXCII) was a leap year starting on Saturday of the Julian calendar. At the time, it was known as the Year of the Consulship of Aelius and Pertinax. The denomination 192 for this year has been used since the early medieval period, when the Anno Domini calendar era became the prevalent method in Europe for naming years. Pope Sylvester I, was the 33rd Pope of the Catholic Church from 314 to his death in 335. He succeeded Pope Miltiades. He filled the See of Rome at an important era in the history of the Western Church, yet very little is known of him. 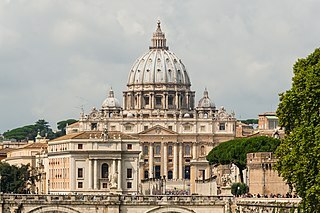 The accounts of his papacy preserved in the Liber Pontificalis contain little more than a record of the gifts said to have been conferred on the Church by Constantine I, although it does say that he was the son of a Roman named Rufinus. His feast is jubilantly celebrated as Saint Sylvester's Day in Western Christianity on December 31, while Eastern Christianity commemorates it on January 2. ↑ "Death toll rises to 39 in Russian apartment block collapse". The Guardian. 2019-01-03. Retrieved 2019-01-07. ↑ "About Jennifer Higdon". jenniferhigdon.com. Retrieved 2 June 2018. Wikimedia Commons has media related to December 31 .